I’ve been a fan of this cider since I first tried it at my first Seattle Cider Summit, but I’ve never been able to find it in bottles around here — at least, until I dropped by the Schilling Cider House and spotted it. Honey Bear is 6.8% ABV, and its color and clarity depend on whether you leave the considerable sediment at the bottom of the bottle or swirl it up and around. The former, and it’s an almost clear light yellow; the latter, and it approximates the opaque amber-brown of good unfiltered non-alcoholic cider. It will come as a terrible surprise when I say that the highlight of Honey Bear is the honey. I know. Take a moment to recover. Behind the aroma and under the flavor come the apples, with a little tartness and acidity, but really this show is about the honey. That said, this cider manages to stay well away from being cloying or syrupy; yes, it tastes distinctly like strong honey, but it’s light and fresh enough to drink by the full-sized glass, unlike the thick, intense sweetness of something like an ice wine or ice cider that calls for a smaller serving size. You can order Methow Valley online, or look for someplace local to pick some up (where local in this case means near Winthrop, Mazama, or Twisp, WA – site seems perhaps a little out of date). If you happen to stumble across this cider elsewhere, I encourage you to give it a try! 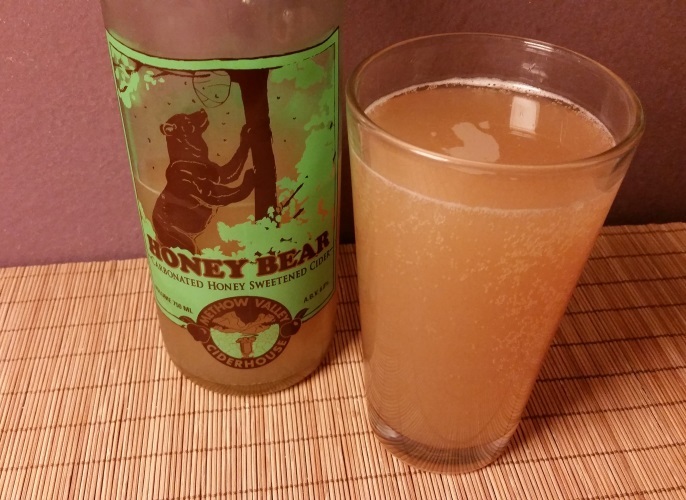 This entry was posted in Cider and tagged 750mL, honey bear, methow valley ciderhouse. Bookmark the permalink. Hi Phoebe, I picked up a bottle of Honey Bear today at Special Brews in Lynnwood based off your review, and am looking forward to trying it. I thought I’d let you know they have it there (at least for now; their stock changes a lot). They also had two other ciders from Methow Valley, Howling Wolf and Pinnacle Goat. Overall the cider selection at Special Brews is awesome; they have quite a few that Total Wine doesn’t. Thanks for your reviews! We seem to have a lot of the same taste in cider.